- We all know about consumer-generated content. Well, now we have loser-generated content. - First there was Voicevertising. 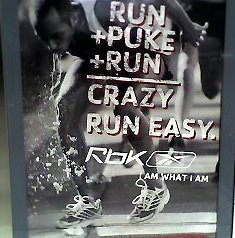 Now there's ThoughtVertising. On eBay, no less! - Bored? Want to go to Cannes but can't? No worries. Forget that ego-fest, stay home and play Cannes Contenders Bingo and you decide who should win. Screw the judges. 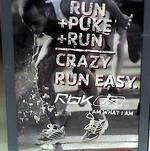 - If Reebok really did make running easy, why would they feature a guy puking in an ad about running easy? Last week, Adrants, Business Development Institute and Boston's Ad Club held the third Advertising, Marketing and PR Industry Diversity Job Fair and Leadership Conference at Boston University. The focus of the event was to ramp up the conversation about diversity in advertising as well as give those interested in beginning a career in advertising a chance to learn what it's like from those who are in the business. With 300 attendees present, the event began with a Keynote conversation between Digitas Boston President Torrence Boon and Arnold Worldwide Multicultural Programs and Community Outreach VP Tiffany Warren who share their experiences working in the industry as well as the roles they play in developing diversity in their companies. Speaking of there being an organization for every cause known to man, the Commercial Closet Association, a group that makes sure the ad industry responsibly includes gays and lesbians in advertising, has announced the nominees for its third Annual Images in Advertising Awards. Another awards show, you say? Yes, indeed. Nominated for the night's top honor of Outstanding Commercial are Subaru, IKEA, Nissan, Lifetime, and Sunsilk, along with their respective ad agencies. To provide alternative coverage to this year's Cannes Festival, Asabailey Advertising and Draw Pictures in association with Ricall, Rushes Post Production, v2film and Final Cut will be producing three videos per day during the festival which will highlight festival events, parties and offer interviews with creative gurus the world over. The work is being done for Cannes Fringe, an alternative news organization of sorts that's been covering Cannes for three years but, this year, will do so in an official capacity. If you more than Advertising Age and AdWeek, give Cannes Fringe a visit for another look at the industry's biggest ego fest. It's Clio time. Here we go. Nike took home Advertiser of the Year. Saatchi New York was named Agency of the Year and Saatchi Worldwide was named Agency Network of the Year. Leo Burnett Italia took home the Best in Show Grand Clio in the TV/Cinema category for its work with Aqualtis Washing Machine. Leo Burnett Lisbon received a Grand Clio for its IAC Alzheimers PSA. TBWA\Chiat\Day New York took home four Gold, three Silver and two Bronze Clios for TV work on Combos and Skittles. Abbot Mead Vickers BBDO London got aGold Clios for its "Bag of Smiles" commercial for Camelot and Fallon London received one for its Sony Bravia Paint. DDB Chicago pulled in 12 Clios for its radio work: two Gold, five Silver and five Bronze for its work with Bud Light. Continuing our support of diversity in advertising, we'd like to let you know our traveling diversity conference in association with Business Development Institute will be making its third appearance in Boston Wednesday, May 16 at Boston University. The conference will discuss the pressing issues surrounding diversity in advertising, educate job seekers on life in advertising an provide those job seekers the opportunity to meet Boston-based hiring organizations such as Arnold Worldwide, Boston Globe, Digitas, Draft FCB, Mullen, Stop & Shop, TJX Companies and many others. The keynote speakers will be Arnold Worldwide Director of Multicultural Programs Tiffany Warren and Digitas President Torrence Boon. The past two conferences held in New York and San Francisco were well received and well attended and there's no reason to believe the Boston event won't be just as successful. For all the details on the event and to register to attend, check out out the event site here. - Today, Joost announced that Turner Broadcasting will begin to distribute content on Joost from its well-known brands and properties, including Adult Swim and CNN. - Here's a little bit of consumer-created hate directed towards Cingular whose phone's apparently can ruin speakers if placed too close to them. The video promotes Feeling Cingular, a site that is less than complimentary to the carrier. - Fallon isn't happy. Citi has just moved most of its global creative account to Publicis Worldwide. - The 11th annual Webby Awards has unveiled winners in 14 new categories.